The 2014 National Spelling Bee competition kicked off this week. Spellers from around the world will compete for the crown in one of America’s most enduring celebrations of academic excellence. While the children are buzzing about spelling words most of us can’t pronounce, I thought it would be fun to pull together a few interactive audio packages that could inspire some practical applications for course designers. Knowing most of you have an affinity for the written word, I thought this would also make a great e-learning challenge. Before we jump into this week’s challenge, take a look at some innovative spelling projects to get a sense of what’s possible. Test your spelling skills to see if you could qualify for the Semifinals. Featuring audio pronunciations and text entry fields, this format is great for practicing your spelling. Are you a word whiz? Test your spelling skills! 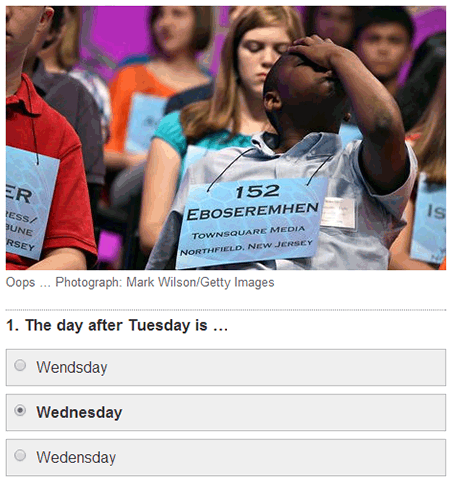 USA Today: Could you win the National Spelling Bee? This quiz includes audio pronunciations and options for visitors to learn more about the definition and origin of the word and to hear the word used in a sentence. Notice any similarities to the previous example? Most of the same options are provided but rather than pushing everything on the slide, the USA Today interactive used a pull approach giving visitors more control over their experience. Click to test your skills! 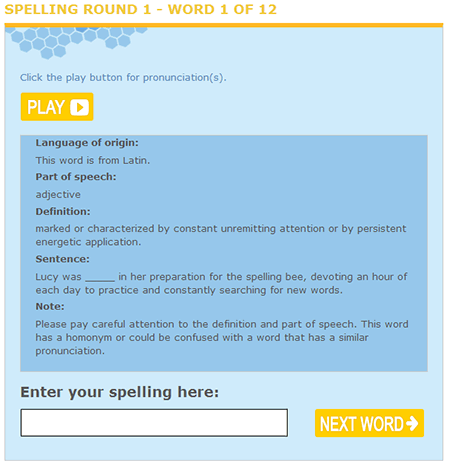 This audio quiz uses a story-based approach to spelling bees. Visitors listen to a story and then spell the words from each story. Clicking the text entry fields pauses the story so visitors can repeat the words. Very clever interaction. I’m hoping several of you take on this model for your challenge demo. 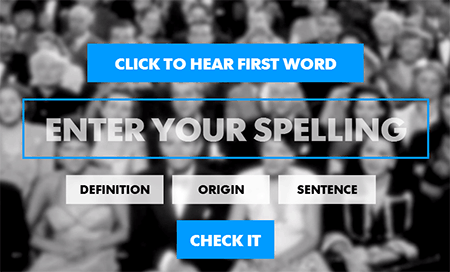 This spelling quiz doesn’t use audio—it’s entirely text based. It’s a good option for course designers who face multimedia constraints where audio isn’t an option. How would you fare in the National Spelling Bee? This week your challenge is to build an interactive vocabulary quiz. You can focus your interaction on spelling, pronunciation, comprehension, or anything else. Look for interaction opportunities to capture learner responses. You’ve seen how text entry and multiple choice interactions can work. What else would work? Merriam-Webster has a good list of words you need to know. You’ll find a great list of study guides, word lists, and resources for the Spelling Bee at Your Dictionary. Charles Hamper stepped us through the a huli in this creative step through interaction. And no, it’s not cheating if you use something not specifically created for the challenge. Charles also shared a great stepper from the New York Times. Thanks, Charles! Karen Loftus used a battery meter for her step through budget interaction. Nice one, Karen! Cary Glenn came prepared to lend The Doctor a hand by stepping us through how to operate the Sonic Screwdriver. Bonus points for the Doctor Who reference. Cary later kick-started another example geared for motorcycle enthusiasts. Great job on both projects, Cary! Lance Treloar put his left hand in and shook it all about in this stepper for everyone’s favorite dance. Lucia Salters shared two fun examples of step graphics. You can find both examples on Lucia’s blog. Thanks, Lucia! Yours truly shared a link to Animated Knots which uses step graphics to teach knot tying. Nick Russell went a little bananas this week to step us through the complex topic of offshore subsidies, intellectual property rights, and the banana industry. 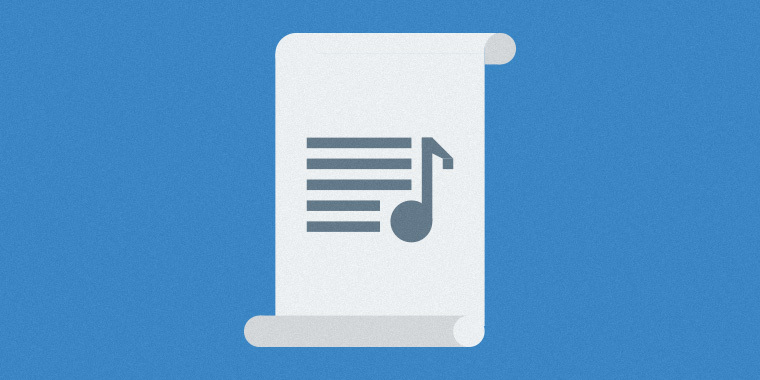 Nick writes more about this topic, his project, and design process on his blog. Well done, Nick! Jade Kelsall shared an out of this world example in her life of a star interaction. Great job, Jade! Dan Sweigert faced the music in this step graphic that walks learners through tuning a kalimba. Dan also posted a detailed overview of his project on his blog. Check it out! Joshua Roberts shared a step-by-step guide to joining the best e-learning community on the planet. Watch it. Learn it. Love it. Thanks, Joshua! Sol Moh demonstrated he has step graphics down to a science in this clean and effective overview of the scientific method. Michael Hinze converted a quick start guide to an interactive step through graphic. You can read more about his stepper on his blog. Ashley Chiasson took things in a more dangerous direction by stepping us through cat bathing. Proceed cautiously and follow the steps as listed. Read more about this delicate process on Ashley’s blog. Dana Dutiel stepped us through caring for dahlias in this easy to follow stepper. As a bonus, she gave us a peek at an ezine concept for our weekly challenges. Nice job, Dana! Mary Cropp added a practice element to her 3-step guide to the SEE Protocol. Nice touch with the added interactivity, Mary! Dianne Hope shared a well-designed stepper based on the SCARF Model. Dianne shares more about her concept, design, and the SCARF Model in her blog post. Well done, Dianne! Liz Braden shared technical stepper for disassembling and reassembling a valve. This is a very practical use for step through graphics. Thanks, Liz! Jackie Van Nice knows e-learning goals and this week shared 10 simple steps for reaching your own goals by leveraging the weekly challenges. You can read more about Jackie's project on her blog. Wishing you a spellbound week, E-Learning Heroes! Even if you’re using a trial version of Studio ’13 or Storyline, you can absolutely publish your challenge files. Just sign up for a fully functional, free 30-day trial, and have at it. And remember to post your questions and comments in the forums; we're here to help. For more e-learning tips, examples, and downloads, follow us on Twitter. Cool challenge David! I LOVE Spelling. Hahaha. I spotted this the other day via Google. https://spellup.withgoogle.com/ Though, I haven't got it to work yet, *stupid microphone*. I can't wait to see some of the entries here! What a great challenge! This is a bit OT, but does anyone know where I can get a royalty-free image like the USA Today example? I've been looking for that kind of audience short for a while. Nick - Thanks! I just got 15 out of 15, so my day's officially off to a good start. I liked that approach, and that you didn't eliminate already-selected words from the list so it felt a bit more challenging. Nick - Great idea having us select synonyms as an alternative. That was a fun challenge. Jackie - Yours really got me laughing. The contrast between the male cop and the little girl and how you tied it into the words in the spelling challenge was very clever. It made me think of the whole Ken the boxer skit from Monty Python. Nick, I second that - what a great idea. Jackie, the contrasts were great. Mine ended in a tie and the reactions to the tie were perfect. Well done, Nick! I really like the word selection option. Hey gang - we isolated the issue to a timezone problem. If you posted a comment and it's not showing up, can you please re-add them? I'm sorry about the hassle. Everything seems to be working correctly now. Nick, loved the select the word concept and I also liked that you kept the selected words available throughout the course. Jackie, omgosh...hilarious..and I loved the words to be spelled...still laughing. Also, great job with graphics and audio...amazing as always. Jackie, what an adorbs submission! I can totally see my little girl making those faces. :) And a unique take with the informal-to-formal approach, Nick. I can't wait to see the rest of the submissions. Hahahaha Dan! Awesome submission and voices. The 'use it in a sentence' made me chuckle more than once, but interaction wise it was great to put the word it in context. Hilarious! Good gravy! Fantastic entries, Dan & Gemma! Dan - the bird voices were great. I think you may have a new niche as a bird voiceover artist, and the topic was a very nice choice. Really funny. Gemma - What an adventure! I hope you'll have further episodes. Really beautifully done! Wow Gemma, that was really awesome. I loved the whole dark castle setting. You really captured a cool mood with the visuals and music, and the touch of humor was really made it fun as well.